Yemen’s Houthi Ansarullah movement set free, on Tuesday, an ailing Saudi prisoner on humanitarian grounds, while the Saudi-led coalition, backed by the US,launches over 100 missiles and shells and keep violating the truce over Hodeidah. The leader of the revolution, Mr. Abdulmalik Badr al-Din al-Houthi, presented a humanitarian initiative to prepare for the release of the Saudi prisoner whose health has deteriorated due to hepatitis without any compensation and after the Saudi regime ignored the call for a prisoner exchange. This came during a meeting with the Special Envoy of the Secretary-General of the United Nations to Yemen, Martin Griffith, on Monday in which the Leader of the Revolution expressed readiness to release the Saudi prisoner Musa Shu’i Ali Awaji as a humanitarian initiative after the Saudi regime ignored its critical health status. The victims toll from a bombing in the southern Yemeni province of Taiz on Monday evening has risen to 42, whereas a source in Taiz told YemenExtra that 6 people were killed and 36 others injured when a bomb planted on a motorcycle near the gate of a popular cafe in the city of Mocha west of Taiz, the moment of overcrowding customers,adding that a media in the Abu Dhabi satellite channel, Ziad Al-Sharabi, was killed while his colleague Faisal Al-Zahbani was injured. The coalition’s paid fighters shelled on Tuesday areas in Saada province with 100 missiles and shells that targeted separate areas in border Razih district over the past hours. A member of demining experts was killed on Tuesday by the coalition’s paid fighters in Hodeidah province, while members of the military committee were in it, asUN-brokered ongoing cease-fire violations. Yemen’s army spokesman Yahiya Sarie called on the UN envoy to Yemen Martin Griffiths to condemn the ongoing violations by the Saudi-led coalition and its paid fighters in Hodeidah and to carry the full responsibility to presser on the coalition states to stop the continuing violations in the province. The Director of the Health Bureau in the capital, Dr. Mattar Abbas Al Marouni, told the Yemeni News Agency (Saba) that at least 107 people were reported to have been infected with H1N1 influenza, including 22 people affected by the disease since the beginning of 2019, noting that reports of infected and deaths cases were received from all government hospitals and private centres operating in the Secretariat,and confirming that there is a shortage of medicines due to the siege imposed by the coalition on all land, sea and air outlets. 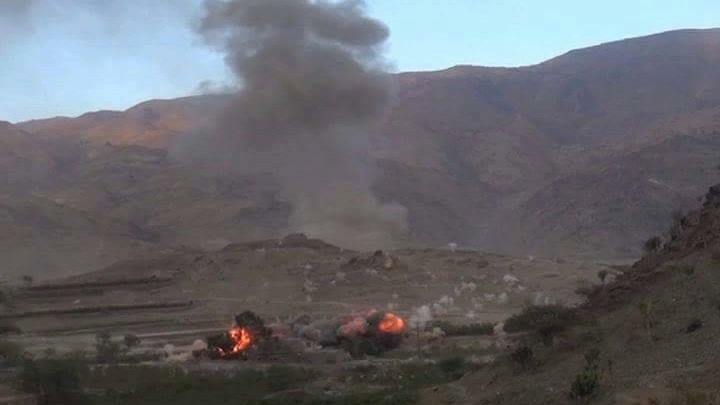 On the other hand, a video showed the Yemeni army forces attacking the paid fighters site s in the southern part of Nar Mountain of Hardh district, liberating 15 sites were controlled by the paid fighters, causing losses in lives and equipment. The Yemeni army’s drone owaged series of strikes on groups of Saudi soldiers in Asir border province, hitting the soldiers in al-Rabuah area accurately. Dozens of the coalition’s paid fighters were killed and others wounded in an explosive device blast in their vehicles in Najran region. Their missile force launched six missiles type Zilzal-1 on the coalition’s paid fighters in Najran region ,whereas four missiles hit gatherings of the paid fighters off al-Sudais site and two others targeted the paid fighters. Their military media released photos of new military batch graduation, named “Honor to the blood of martyrs”, which is a part of the central Military region of them, performing a military parade and a live combat exercise.